Summary: Putin’s talk of Ukraine’s transitional government as being entirely made up of neo-nazis who target Russians is an exaggeration, but there’s some truth in it. 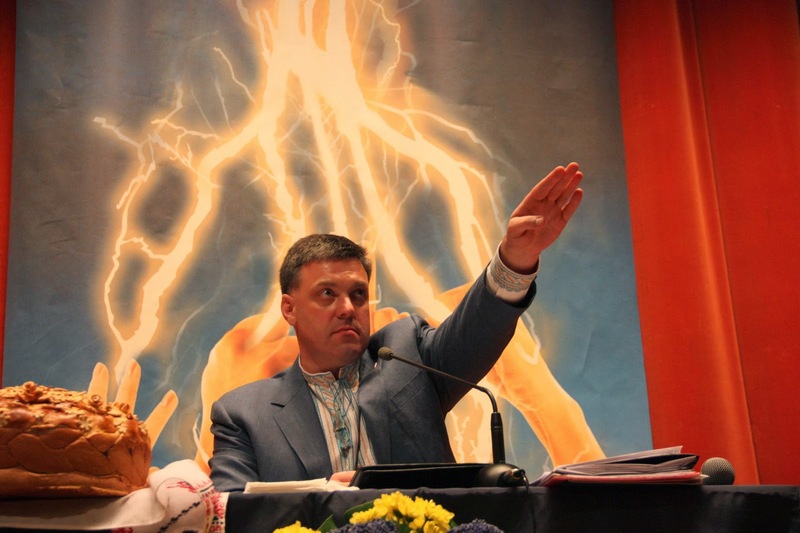 Ukraine’s new government includes neo-nazis of the Svoboda party and is not representative of the whole country. EU sanctions are impossible as the EU relies on Russia for gas imports. Arming and funding western Ukrainian groups to fight Russia and its allies would only tip Ukraine into a Bosnian or Chechnyan style civil war. 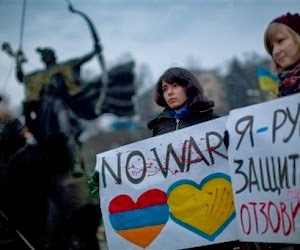 Russia will not back down on this issue as Ukraine was used as a base by its enemies in both World Wars and Chechnya was used as a base by terrorist groups far more recently. Ukraine’s government should settle for granting Crimea, with its Russian majority, autonomy – and guaranteeing Ukraine will not join the EU or NATO in order to avoid such a war – and the US and EU should encourage them to make these concessions. Most of the western media talk as though President Putin’s characterisation of the Ukrainian transitional government as neo-nazis who threaten the lives of Russians in Ukraine is purely propaganda. There is some truth in Putin’s claims though, despite his exaggerations, and despite him being an authoritarian hard line nationalist himself, as well as a frequent propagandist. The largest party in the transitional government , the ‘Fatherland’ party, are not neo-nazis, despite their name. However the ‘National Socialist’ Svoboda (‘Freedom’) party, notorious for its anti-semitism and hatred of Russians and other minorities in Ukraine, has four ministries in the transitional government including Defence and Deputy Prime Minister (1) – (5). Svoboda also has 37 seats in parliament, which approved the Interim Prime Minister and President (6). It won only 10% of the vote nationally in the last elections, but over 40% in parts of Western Ukraine, with the party with the largest share of the vote in the East being the now overthrown President Yanukovych’s Party of the Regions (7). Svoboda’s four ministries in the transitional government are clearly representative of its support in western Ukraine and a huge over-representation relative to its support in the country as a whole. Svoboda members and some of its MPs still publicly celebrate the Ukrainian SS unit recruited by the Nazis during World War Two and the Ukrainian nationalist Stephen Bandera who allied with the Nazis (8) – (9). The Deputy Secretary of National Security is Dmitry Yarosh, former head of the paramilitary Ukrainian nationalist group Right Sector, whose members fought against Russian troops in Chechnya (10). 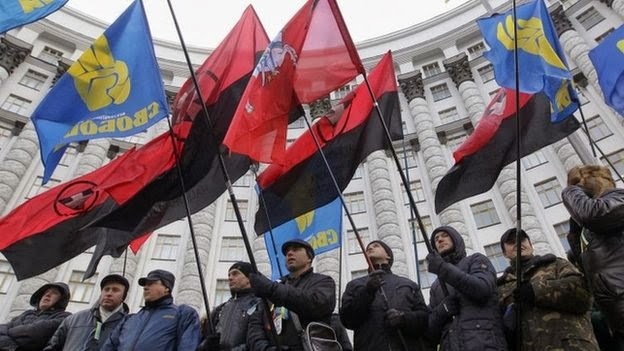 The opposition majority in the Ukrainian parliament voted after Yanukovych’s overthrow to revoke a law which allowed Ukraine’s regions to use official languages of minorities such as Russians, Hungarian, Romanian, Bulgarian and Tatar along with the Ukrainian language. Ukrainian was to become the only language which could be given official status (11). Interim President Arseniy Yatsenyuk reversed this ruling. His party Batkivshchyna, or “Fatherland”, is the largest in the transitional government and parliament and luckily it is not as extreme as its name would suggest. Yatsenyuk is Jewish and comes from a family of mixed Romanian and Ukrainian descent (12) – (14). Svoboda and other ultra-nationalist protesters included many armed with baseball bats, iron pipes and a few guns who still patrol Kiev. Medieval style trebuchet catapults were also used to fire rocks, bricks and petrol bombs at riot police. The last were mostly reported as being amusing, but would be quite capable of killing (15) – (18). This violence by ultra-right militias may have led to the use of snipers by the government, if those were government snipers (various unsubstantiated rumours include that they were Russians, mercenaries hired by the opposition, or mercenaries hired by the US), though it certainly didn’t justify it. The transitional government is overwhelmingly made up of parties which want to join the EU. Russian actions in Crimea have been sending a message that, as Russian spokespeople put it, this is a “red line” for Russia. The Ukraine has a large Russian speaking minority, Russian military bases, is right on the border of Russia, historically a close ally of Russia – and an invasion route for the French in the 19th century and the Germans in the First and Second World Wars. More recently secessionist republics trying to leave the Russian federation, including Chechnya, were used as bases by terrorist groups for attacks inside Russia (though Russian military torture and massacres in wars against the secessionists contributed greatly to recruitment by these Islamist groups). President Putin’s popularity in Russia is based on nationalism , restoring Russia’s pride after the collapse of the Soviet Union and economic collapse under Yeltsin’s experiments in an absolute free market that led to chaos. It’s also based on him being seen as a “strong” leader who will stand up to pressure from the US and its allies. Putin is certainly no democrat, but its hard to believe that any other Russian government would have reacted any differently to a US backed revolution in one of its closest neighbours and allies which also contains strategically important naval bases. The threat to Russians in Ukraine only adds to this. If there had been a Russian backed revolution in Canada or Mexico, in which ultra-nationalists threatened US citizens, the US wouldn’t have responded any differently. If the Ukrainian transitional government attempts to join the EU the likely result will be either civil war in Ukraine with the Russians and Americans each providing arms and training to their proxies there, or else a Russian invasion to install its own client government and prevent US-backed paramilitaries using it as a base, or both. This would not be good for the people of the Ukraine – not even the ones who survived it. Nor would risking direct military intervention of the kind advocated by the right in the US be good for anyone. It is not wise to suggest potential escalation to World War Three between two nuclear armed powers. Sanctions on Russia would have little downside for the US, which could afford to play geopolitics with Russia in this way, but western Europe gets much of its gas for heating and electricity from Russia. Germany, the largest country in the EU, gets 25% of its gas imports from Russia. While the Ukrainian parliament is elected, the transitional government is not. Only after new elections will there be a fully legitimate government representative of all Ukrainians. The US government has repeatedly condemned changes to the consitutions of Honduras under Zelaya and Venezuela under Chavez when carried out by democratic referenda and elected constitutional assemblies. This leaves it looking more than a bit hypocritical when condemning the Russian government’s criticism of the transitional Ukrainian government as being in breach of Ukraine’s constitution. The Russian majority in the Crimea voting by referendum to leave Ukraine would no more be against international law than Kosovo’s Albanian majority voting to leave Yugoslavia by referendum. The US government opposes the first and backed the second purely in order to expand its own influence and reduce Russia’s. It has no democratic principle behind its positions. Minorities in Crimea justifiably fear repression under a Russian nationalist client regime, but the fears of Russians in Crimea of being ruled over by a government including Svoboda are just as real. Given the massively greater military power of Russia and Russia’s fear of Ukraine being used as a base for its enemies, as it was in both world wars, the best deal the Ukrainian government is likely to get is to give up the Crimea in return for staying in power itself while agreeing not the join the EU. (That’s before even taking into account Russian fears of Ukraine being used as a base for terrorist attacks into Russia, as Chechnya was by Islamic militants). Giving western Ukrainians the false impression that the EU will use economic sanctions on Russia (which Putin might well choose to endure to maintain his strong man image and which would hurt the EU more than Russia) to tip the balance, would be misleading them and doing them no favours. Ditto for pretending that the US will fight World War Three for them. Arming and funding groups that include neo-nazis and so reducing their country to a Bosnian or Chechnyan style war in the name of “freedom” would be even worse. There is no freedom for anyone except the killers in a civil war – and no freedom even when it ends if one side are Russian ultra-nationalist extremists and the other side Ukrainian neo-nazis.